This means we're having 1294 bikes on the store at the moment and the shop manager gets alarmed when the number of bikes reaches 100. Simply, the manager of the shop wants to find the products he's running out of. 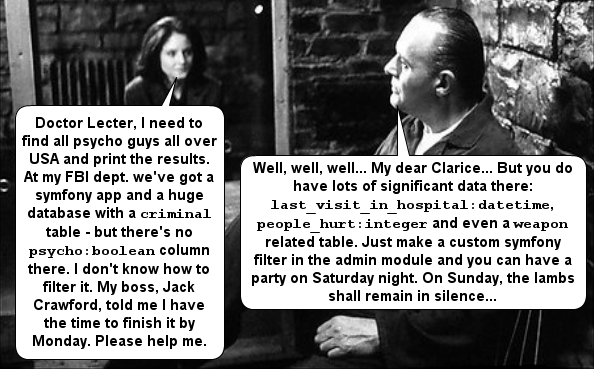 He just wants to have something like a checkbox in his product admin generator filters. When he runs the filter with alarming attribute checked, he wants to see only those products which number is below the quantity_alarm. * Applies the alarming attribute to a given query retrieving products. * @param Doctrine_Query $query - query to have alarming attribute applied. * @param Integer $value - alarming? The whole thing is complete! The code could be written in many different ways, of course. The sfValidatorPass is used to pass unchanged filter values. There are three distinct values possible: empty string for 'yes or no', '0' for 'no' and '1' for 'yes'. If empty string is passed, we ignore it. If '0' or '1' is passed, we check it inside the switch statement. If you're wondering about sfValidatorBoolean, it can't be used, since there are 3 options (yes, no, yes or no) and the boolean validator can handle only two values (but it can be used in other custom filters with no problems). 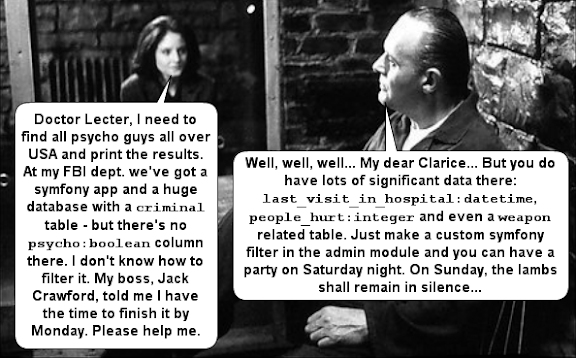 The above article is based on a magnificent symfony forum post by dlepage. It has been tested on symfony 1.4 but should work also with versions 1.2 and 1.3. The following article has been tested many times on symfony version 1.4 (and has been updated few months after initial publishing). 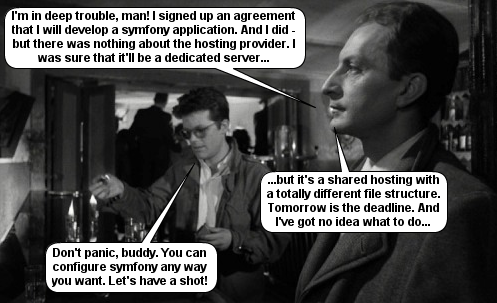 Sometimes a symfony project has to be deployed on shared hosting. It may be especially difficult if no SSH access is provided - this is because one of the main symfony tool is the Command Line Interface. But there are more problems, such as the directory structure of the user's account on shared hosting, which may not be changed. You are forced to modify your app structure as well then. So let's face those problems! You'll have to modify your all controllers (all applications and all environments) to update the project configuration class path. The original web project directory has been renamed (this doesn't matter) and moved one directory up (and this matters - the path needs to be updated). So our application is linked to the symfony lib which is inaccessible from the web, as well as the symfony application code (apps, config, lib, etc.) is inaccessible from the outside. If you want to host many symfony apps on one account, it's better to modify above structure. The best solution is to create subdomains (or any other way to access the site from a different URL) but never put everything (entire application structure) into apache's document root directory (e.g. public_html). Symfony framework comes bundled with many great plugins, they can be extremely useful for your projects' functionalities. But there are very few plugins that provide documentation functionalities. While developing a big project, it's really easy to get messed up with working on dozens of model classes, modules, actions, etc. Each of them performs different tasks, each of them may be found very useful while designing and developing your sites. This plugin is an alternative to sfPhpDocPlugin. Doxygen seems to be the best cross-platform documentation tool available, including lots of configuration features (one of them is easy UTF-8 rendering, in comparison to phpDocumentor which still lacks support for any encoding different than ISO-8859-1). You only need to have doxygen installed, execute few tasks, modify the configuration and your code documentation is ready. Remember that a developer has to go back to the application code even few years after finishing a project. If no documentation is found then, applying even small changes is... quite difficult. The last two plugins are based on GraphViz, a wonderful graph rendering tool. The plugin is provided with only one task and is easier to use than sfDoxygenPlugin. After installing you only need to run one task and the application map is already generated. What is this application map? It's a graph in which each element of the controller has it's own node. That is, the project-root node has child apllication nodes (e. g. backend, frontend), application nodes have child module nodes (including both admin generators and custom modules) and, finally, module nodes have child action nodes. Each node is labeled with the name of the project, application, module or action, depending on the node type. Each action is additionally provided with the documentation code. All this makes sfApplicationMapPlugin a very useful tool when you want to take a brief look at you application and you don't like browsing lots of files - the plugin does it for you and generates nice images. Take a look at the plugin readme to see example application maps(#1, #2). Why using DBDesigner and spending your time on updating a file which won't be used in your project, when all the database schema information you need is present in schema.yml files? This is where the sfDoctrineGraphvizPlugin comes to help. Just like sfApplicationMapPlugin - just install, run one task and the images are generated for you. During site development, a developer usually doesn't care about documenting the project. But if he leaves it for a long time, or when a new developer comes to replace him, understanding of a project becomes a big problem. Don't forget to provide a good value documentation for you projects, it takes very little time - and eventually saves a lot of it.